Told in a seamless combination of words and line drawings, this story introduces Ottoline and her small hairy companion Mr Munroe whom Ottoline’s explorer parents found in a bog in Norway. Ottoline lives in what looks like a New York skyscraper apartment which accommodates not only her parents’ eccentric collection of interesting things (portable fishbowls, snuff bottles, seashells) but her own collection of Odd Shoes. 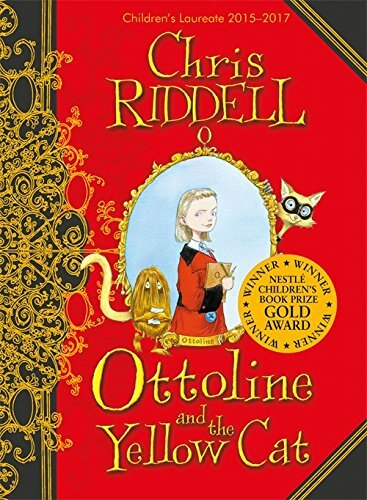 While her parents are away Ottoline and Mr Munroe, who like solving problems and working out clever plans, use their skills to outwit a cat burglar who has been selling lapdogs to rich society women and using the information thus provided about their owners’ treasures to rob them. Riddell creates character deftly (cf his criminal lapdogs…) and he complements his fluent, wiry line with a discreetly sparing use of the colour red to highlight the drama, emphasise a detail or punctuate the visual narrative. Tension and mood are effortlessly conveyed in the arch of Ottoline’s eyebrows, in the quivering tautness of a lapdog’s tail or in a glimpse of Mr Munroe’s large eyes behind his fringe of hair. Hugely enjoyable.